It’s a common issue I hear from parents: ‘my child didn’t sleep well last night’. Sleep deprivation is a concern that is frequent for individuals with Autism Spectrum Disorder (ASD) and is a regular issue encountered by the team here at Therapy Spot. The most common problems include: difficulty falling asleep, waking up early in the morning and repeatedly waking up throughout the night. 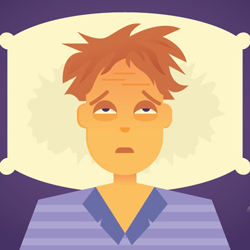 Research shows that sleep deprivation has troubling impacts on people. The effects of sleep deprivation have been evaluated in children with sleep-disordered breathing (SDB). Individuals with SDB may experience disrupted sleep from loud snoring or sleep apnea. Sleep deprivation has been linked to problematic behaviors throughout childhood. Children may present symptoms similar to Attention Deficit Hyperactivity Disorder (ADHD) including; hyperactivity, trouble interacting with peers, aggressiveness and inability to follow rules. Establish a bedtime routine (no more than 30 minutes long) with relaxing activities. Adapt the bedroom to suit your child’s sensory needs. Keep bedtimes and wakeup times consistent throughout the entire week- including weekends. Don’t share a bed with your child. Encourage exercise throughout the day to aid deep sleep. Eliminate electronic screen time (iPads, TV, computer, etc.) an hour or more before your child’s bedtime. Although it is possible that melatonin supplements may be an effective sleep treatment for children with ASD, the research has not been conducted with large enough sample sizes. Studies with more individuals are still needed to ensure the reliability of the research. With consistent routines and some planning it is possible to greatly improve sleep patterns. Both your child and your family will benefit from set sleeping routines and smart bedtime planning.